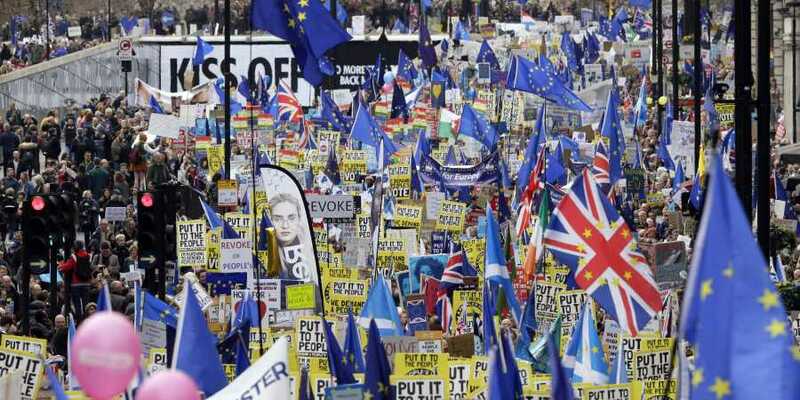 LONDON–Hundreds of thousands of pro-Europeans from across Britain were expected to march through London on Saturday calling for another referendum on EU membership with the country mired in political paralysis over Brexit. Opponents of Britain's departure from the European Union will gather near Hyde Park from noon (1200 GMT) before converging on Westminster in what organisers are calling the "Put it to the people march". Speakers including Scotland's First Minister Nicola Sturgeon, London Mayor Sadiq Khan and opposition Labour deputy leader Tom Watson will then address the crowds at a mass rally outside parliament. "Brexit is a complete and utter mess," Khan said on the eve of the event. "I'll be marching on Saturday with people from every part of our country -- from every walk of life -- to demand that the British people get the final say." The protest -- set to be one of the largest in the capital in decades -- comes after EU leaders this week granted a delay to Brexit, prompting Prime Minister Theresa May to make a renewed bid to win MPs' backing for her divorce deal. If she succeeds, Britain -- which was staring at a cliff-edge deadline of March 29 for leaving the EU -- will depart on May 22 under the terms of the withdrawal agreement the prime minister struck with Brussels last year. "I am an old man and the outcome won't affect me -- but it will affect my family and many people that I know for years to come," he said in a statement released by organisers.